One of the the most unique features of Villa Bayu is how much scope there is for children of all ages to have fun and how well equipped we are for children, babies and toddlers, which means that their parents can also have a rare opportunity to relax and have a holiday. From the large lawns, just perfect for ball games and running off that extra energy, to the pools, both of which have steps for non-swimmers to play on and one has a baby pool, to the pool toys, board games and DVDs – there is so much for children to do. On top of which, baby care items such as high chairs and travel cots are provided without additional cost and meals are of course prepared by our villa cook who is happy to accommodate the unusual eating habits of small people! Villa Bayu has a large collection of baby care items including travel cot, high chair, bottle sterilizer, car chair (up to 12kgs) and plastic plates and cutlery. Please ask the staff if you need to use any of these items free of charge. Both pools at the villa have a step for non-swimmers to play on and Villa Bayu II has a baby pool which is ideal for little people to potter around in. Pool toys are provided, some of which are inflatables. We find that the pools, which are part of the living areas, are well located for easy vigilance while your children are swimming, but pool fences can be installed if you are more comfortable with this option, at a small additional cost. We work with http://balivillapoolfence.com/to install pool fences when our guests request them. The cost is US$10 per day plus US$30 installation fee. We have a travel cot available, as well as an additional single bed which can be placed into any of the bedrooms in the villa. 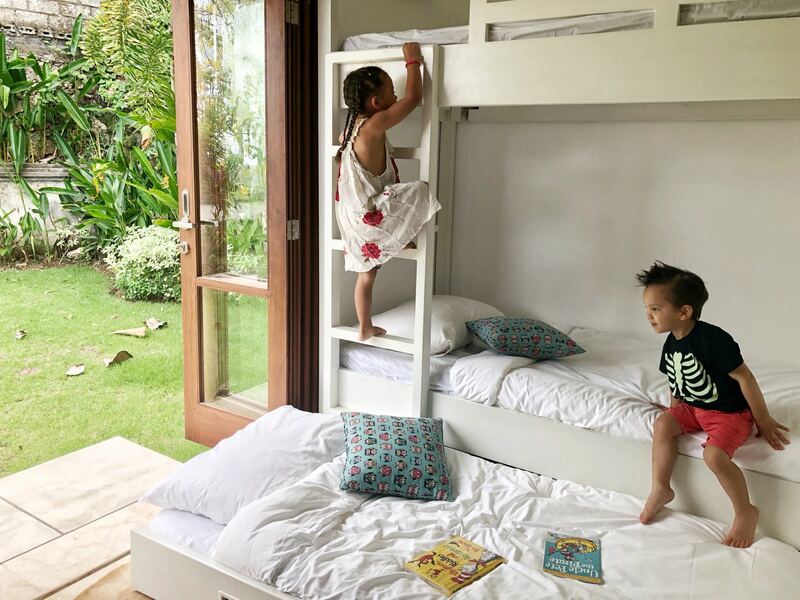 Villa Bayu II has a bunk bed room adjoining the master bedroom which sleeps three children (there is a bunk bed with a trundle bed that can be pulled out underneath) and has its own access to one of our many gardens, so the children can spill into it to play. As the villa is large and the bedrooms can be a little way from the living areas, we suggest you bring a baby alarm with you for when young children are sleeping. The villas have a selection of pool toys, board games and DVDs and Villa Bayu II has an Apple TV with Netflix account for streaming children’s TV programmes. Please see our things to do list (see link below) for activities for children outside the villa. The villa staff are always happy to play with the children and toddlers, but if you would like babysitting services then this can be arranged at additional cost. Please ask the villa manager for help with this.